Bally’s Silverball Mania is from 1978. Some aprons take a beating. This one was actually quite nice, but had a coin operator’s registration sticker smack dab in the middle. Every attempt at removing it failed. Well, I did get it off, but with all the paint, too. I was left with a rectangular bare spot of metal. The only solution is to completely repaint it and apply a new decal. 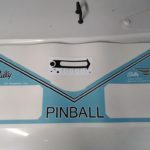 A decal for the apron is available from Classic Arcades on eBay. 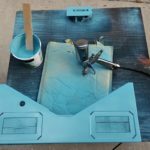 The tricky part with these decals, since they are not printed on clear material, is matching the color for the painting process. I took the apron down to my local Ace Hardware and they didn’t a perfect color match. I was pleasantly surprised at how well it turned out. The next step was to paint the apron. 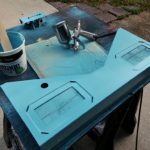 After the paint was applied and allowed to dry, I applied the decal. The only thing I didn’t like about it was it had a white edge along the top side that was plainly visible. As a workaround, I trimmed the decal along the top and the side of the black and white stripe. Now, when it is installed, it looks completely original. I also restored the ball shooter gauge. That was pretty simple. Paint it and apply the decal. 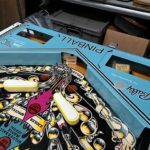 This apron was part of a playfield restoration and a collaborative project between myself and Pinball Pimp (Jeff Miller). Look for more photos of the game in the future. 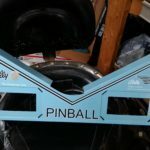 This entry was posted in Playfield Restoration and tagged apron, bally, Pinball, restoration by Pinball Shark. Bookmark the permalink.